When it comes to money, Aleppo has it, and the monied families don’t like their businesses interrupted by the Cheaper Syrian Army or the so-called “Unity Brigades”. Whatever the moniker, the alias or the calling card, it’s business versus terrorism. Our source in Aleppo who is my wife’s nephew says that the terrorist presence is overblown by the Western media. However, he did say that prominent families like the Jabiri clan, has demanded the army’s presence “at once”. Dr. Assad did not fail. 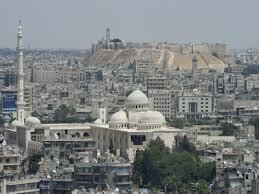 The City Mosque can be seen here gracing the astounding Citadel that is the symbol of Aleppo. Elements of the Third and Fourth Army Corps have been dispatched to finish any hopes the FSA may have had about establishing an hq in one of the two major cities of Syria. The BBC falsely reported that Syria has deployed combat fighter planes which were seen strafing positions near Aleppo. My wife’s nephew, George, says “no”. Whilst helicopter gunships flew over Aleppo, no jets were ever seen. The Syrian army cannot allow the terrorists to entrench themselves in any old part of the city, like Bab Al-Faraj, where narrow streets and alleyways make armored movements impossible without wholesale destruction to buildings. Aleppo has a large population of Armenians and Syrian Christians who are very loyal to the government with large Sunni merchant classes completely at odds with the terrorists and the Saudi Arabians over the issue of “regime change”. The Syrian army expects, therefore, to be greeted with open arms by the inhabitants. American sources, always anxious to paint the government’s situation in bleak prose, claim that the redeployment of units outside Idlib, around the Turkish border and at the north end of the Wadi Al-Ghab, indicate an “overstretching” of the army’s capabilities. We agree that the constant appearance and disappearance of the enemy is taking its toll on the military’s speed in responding to infestation. But, information is also coming in from direct sources close to us, that Syria is calling up large numbers of reservists from areas know to be extremely loyal to Damascus. The reservists are fresh troops whose role is to take up the slack and cover for units now involved in the fighting in and around Aleppo. As we write, significant fighting is taking place in the Hanano quarter of the city. The Syrian army is quite inured to the basic techniques of the FSA. I mean, there is nothing new or innovative about the way they fight. They counter the army’s overpowering technology and numbers with stealth and the time-worn axiom about the defensive posture as a multiplier of capability. With new encoded American telephones, they are also able to communicate with little chance of eavesdropping or interference from the security services. 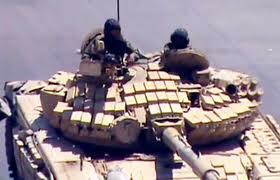 FSA RPGs are becoming less of a problem as the Russians beef up Syria’s armored corps with new platings as can be seen above on this T-72 assault tank. The only devastating shortcoming from which the FSA suffers is a track record for gross stupidity. It all started out with Colonel Harmoush, the blowhard leader of the FSA who was lured into captivity and execution by the Air Force Intelligence Bureau. The same bucolic style is still reflected in the crude methods the terrorists use, often inflicting wounds on themselves through misalliances with know criminal gangs. As you can read from articles posted on this site, many Sunnis are openly stating that the FSA is a greater threat to them than the government. A note just came in by e-mail indicating that the city of Aleppo has now been completely surrounded by the Army. Engineering units are also seen deploying echo-instruments designed to detect tunnels. It may be the terrorists are now in their Alamo with no gutter through which to escape. MANAF TLAS, FRESH FROM DETOXIFICATION, ANNOUNCES SUPPORT FOR TERRORISM! From Doha, Qatar, the seat of systematic lying, child molesting and banana-worship, comes this earth-shaking revelation: FORMER TINPOT GENERAL OF SYRIA’S FOURTH ARMORED DIVISION, SON OF MUSTAPHA TLAS, DAMASCUS’ RESIDENT COGNAC FREAK AND JADED HIPPY, MANAF TLAS URGES TRAITORS TO JOIN THE RANKS OF TERRORIST GANGS IN SYRIA. After having spent almost 16 months under house arrest for incompetence, Manaf Tlas began to sport that wasted look so much in vogue during the late 60’s in America. Can anyone believe this dork was a general? We cannot judge his father, retired general of the army Mustapha Tlas, who served as defense minister for over 30 years. We know his father frowned on his desertion and wanted him to stay put in Paris. But, constant offers of generous rewards from Prince Fatso Husband of Madame Banana prevailed on the young Manaf who was weak and put off by his father’s promises to “cut him off” from the family estate. 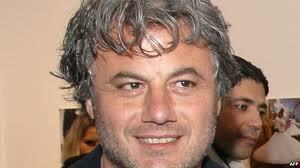 He appeared on Al-Jazeera and exhorted his comrades to “fight for Syria” and overthrow the government of Dr. Assad. Our reports indicate the FSA wants nothing to do with him. There are some who believe his defection was a ruse designed to implant him within the ranks of the terrorists. Most others with knowledge of matters military believe the FSA does not want a prima donna general in its midst and has jealously guarded its own core of stupidity. Manaf’s reputation for military planning is execrable. Major Abu Bilal Sulayman told me a while back that Manaf couldn’t command a pack of cub scouts. Manaf can now confabulate with Lamia Al-Hariri, deserting hag Syrian ambassador to Cyprus, and her miserable Der’ah-born husband and swineherd, ambassador to the UAE, (countries with which Syria has zero relations), Abdel-Latif Al-Dabbagh. Both fell for the smell of money and the promise of eternal exile. Good day! Have you ever tried to exploit any specialized services to attract more readers your site on a regular basis? Can’t wait to see your answer.